Lee Goldberg @ 4:17pm: "I am very concerned about flooding tomorrow afternoon." Greaat lol lets throw some wind in there somehow at least make it tiny bit interesting. I doubt there will be any direct winds with Michael but some good thunderstorms are possible. Where did you see this map? Latest I see on their Twitter has us marginal. Still only showing 1 to 2 inches on map. That's not excessive. At first I thought this was severe storms darn. That's old, Jman. Look at the NHC Twitter and you'll see the updated WPC rainfall maps. I'm surprised there's no severe weather threat with a tropical system and front. Quietace I hope you are ok??!! I hope Ryan is holding onto his hat! Snowfall winter of 2018-2019 25.10"
Snowfall winter of 2017-2018 51.9"
Snowfall winter of 2016-2017 45.6"
Snowfall winter of 2015-2016 29.5"
Snowfall winter of 2014-2015 50.55"
Snowfall winter of 2013-2014 66.5"
Wow ya the pressure was crazy low. I saw some footage from landfall area. Nothing was standing still....everything was destroyed except the reinforced building the person filming was in I guess. These storms are becoming more numerous in hitting land each year it seems. "Go hug a human, not a weather model"
"In weather and in life, theres no winning and losing; there's only winning and learning." WINTER 2012/2013 SNOW TOTALS 43.65"
WINTER 2013/2014 SNOW TOTALS 64.85"
Yeah saw the video on TV, just terrible. In our weather seems the flash flood watches needed to be into the northeast, not here, the flooding rains are all happening way north of here, not sure if we see much at all, even NHC has 1-2 at best for majority of area except for south jersey to about central jersey and just south of LI. Weird. Mexico Beach is no more and those who tried top ride out there are missing - Miami Dade Fire and Rescue on teh ground there said they aren't talking about the death toll. Scary to hear. If you look at pressure anomalies, you will see how there are strong negative anomalies rapidly overtaking the CONUS as the midwestern system continues advancing in the wake of the departing high. This will likely distort the lower-level convergence such that the core will not be able to maintain its current progression, even with the other favorable atmospheric conditions. Remember, the stronger these systems become, the more perfect the environment surrounding them needs to be in order to maintain and/or strengthen them further. In my opinion, I think this disruption in the lower-level pressure field will outweigh the environmental conditions as it approaches the coast, and lead to a plateauing and then late start at a decay prior to landfall. Nonetheless, it will still be a powerful and destructive storm, but in the end, think it will fall short of current progs. We shall certainly see, one way or the other. Thinking back more on this, and about why I might have been looking at this the wrong way, it struck me: This system was DIFFERENT from other systems this season, and from other systems where I have used this similar thought process. Obviously each system is different, but there were a few this season where I distinctly remember successfully using this parameter as a metric to gauge if a system would strengthen or not as it approached the U.S. mainland, or wherever else their destinations were (some were just out in the open water). Anyway, these previous systems were all headed directly into broad regions of anomalously high pressure, thereby experiencing enhanced lower-level convergence. HOWEVER, their forward speeds remained relatively unchanged as they progressed. Michael, though; was different. Even though Michael was headed into a region with significantly lower than normal pressure anomalies across the eastern CONUS, its forward speed was steadily but rapidly INCREASING as it drew nearer to the U.S. Because of this, I hypothesize that this helped to overcome the impact that I originally expected **with regard to the role of lower-level pressure anomalies interfering with the lower-level convergence around the storm's circulation**, as the increasing forward speed helped to negate the lack of lower-level convergence/divergence caused by the system coming through the Central Plains. Now, the other environmental conditions could have simply overwhelmed the surface, but I suspect not entirely, as again, the stronger these systems become, the more perfect their environment needs to be. However, this will be an interesting thought to test on future systems to see if it might have merit. Anyway, a little post-storm reflection never hurts. 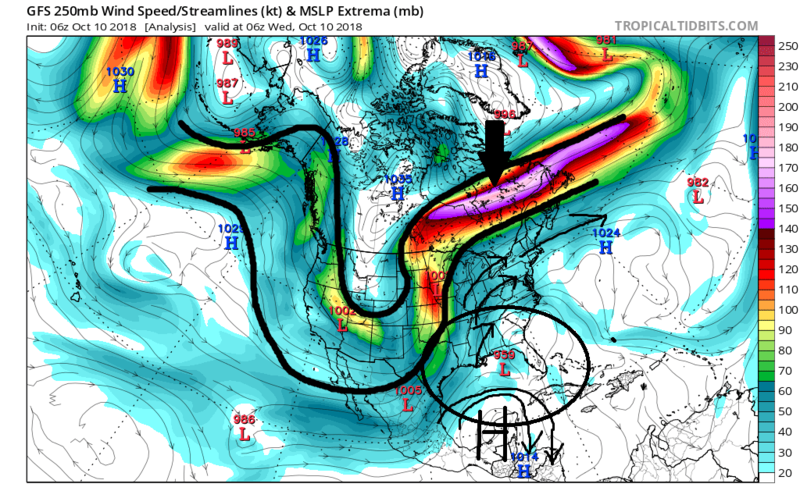 I know its probably multifactorial, but I honestly believe that the large scale upper level environment is the real reason he cont to strengthen all the way through landfall. Looking at the last two frames of the GFS before landfall you can see the shear magnitude of the mean trough and the associated jet streak. I mean it literally involves all of North America originating in the N tip of Alaska running south all the way into the N fringes of Mexico, back north will into N and Central eastern Canada; extending well out into the N Atlantic. The jet streak alone is approx. 3000miles long give or take. Also Notice how the JS is actually strengthening as Mike comes ashore; not weakening, and the trough itself is in a neutral to maybe slight neg orientation. 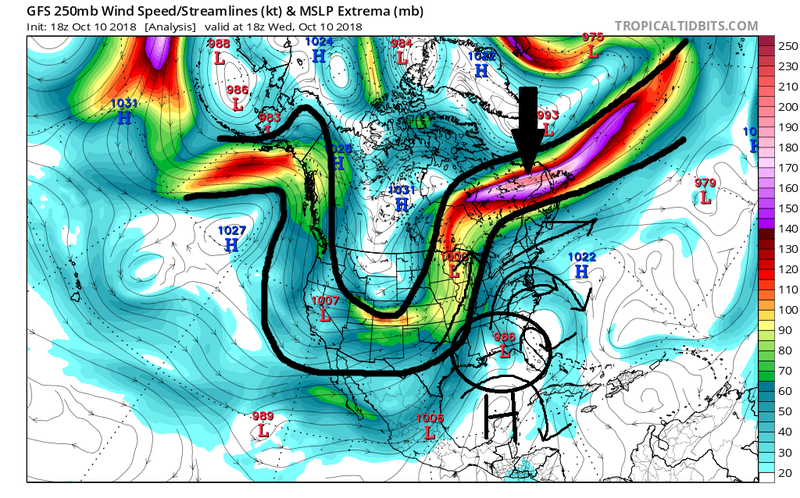 The shear size and scope/magnitude of the mean trough/jet streak complex, I believe, created an extremely favorable region of upper level divergence(R Rear quad), the center of which appears to be directly over head Mike such that it had to respond by lowering pressure. Again its a situation where size really did matter along with location location location of Mike. Of course there were other factors as well, like the environment to the immediate N, E and S leading to good outflow to go along with he aforementioned conditions, but I think there were large scale features that easily were able to over ride some of the possible smaller scale inhibitory factors. I also believe this large scale upper level divergence over top a large area surrounding Mike is why he initially persistently strengthened beyond the Yucatan straits despite being under moderate shear. Once the shear began to back off he steadily increased the speed at which he strengthened because the upper levels cont to improve all the way into the coast. Anyway that's my two cents on the matter. Ray any thoughts on this theory? I watched a bit and then forwarded to where they said around 34 min..these guys are lucky to be alive!! !